> McAfee > Technology and approach for providing real-time, protection for all types of databases. in their efforts to cash in on this treasure. 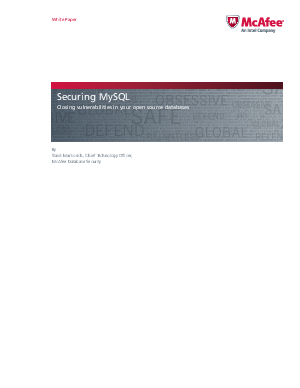 The most effective way to protect any database is with effective multilayered database protection. Compliance officers and regulators know this. So does McAfee. That’s why McAfee has recently bridged the MySQL security gap with a unique solution that combines an open source auditing plug-in with industry-leading database security modules—the McAfee MySQL Audit Plug-In.